"Grand Canyon in the Snow"
This comes from our first trip to Sedona, Arizona in 2003. For some reason we were in more of an exploring mode that usual, and we took two trips from Sedona to the Grand Canyon. On the way out we stopped at the Grand Canyon but it was snowing pretty hard. Not to be foiled, we drove a little and found this scenic overlook. We had just gotten the Sony camera which wasn't waterproof and I took these photos while Ann stood beside me holding an umbrella to keep the snow off the camera. We got home and I went all Claude Monet with this painting with the subtle blues, greens, and violets of the canyon. Look closely and you can see the far side of the Grand Canyon as the colors turn to the lighter greenish white against the violet. All very subtle, just a small, but distinct change of color. The bare branch snow covered tree in the foreground gives some perspective to the picture. A couple days later we went back to the Grand Canyon, the snow was melted and we spent a great day doing Grand Canyon stuff. 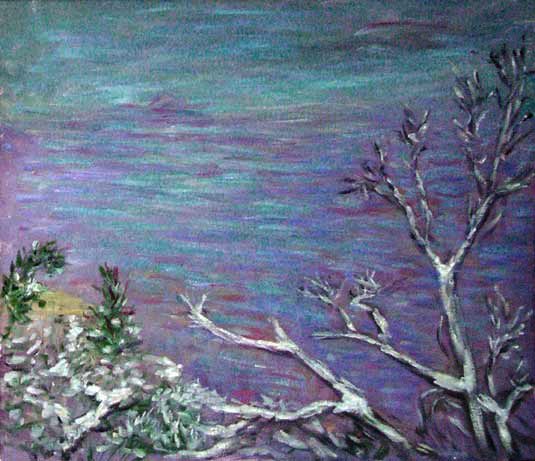 PaulB's Pointillistic/Impressionist original oil paintings of Grand Canyon National Park and various prints and poster formats of a wide variety of subject matter by the Pointillistic/Impressionist oil painter from landscape/waterscape paintings, dance, sports, portrait, to classical figures, flowers, rock and roll, Brazil, and National Park and Grand Canyon paintings and prints are available for purchase for as little as $24.95 for an 8" x 10" matted print on photo pape. Pointillistic/Impressionist Giclee prints of Grand Canyon National Park on real canvas or heavy watercolor paper are available. One of a kind Grand Canyon National Park embellished prints, which are Giclee prints retouched in genuine oil paint by PaulB. Unless noted PaulB's original Pointillistic/Impressionist oil paintiings are oil on canvas. Paul Berenson's pointillistic/Impressionist oil paintings are in privale collections around the world, including the downtown Los Angeles Athletic Club and have appeared in numerous publications, including the New York Philharmonic Playbill. PaulB.com also builds websites and PaulB is a member of the LA Web Professionals Group.